A ghost story. In Utah. This one is sadly all true. 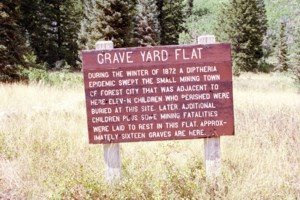 Read r the Wikipedia entry about the mining town of Forest City, Utah. It makes good reading, especially for those not well informed about infuenza epidemics and what effect that had before widespread public immunization. If you're really going to go to all that trouble, find out about some of the serious 4wd trails around Mineral Basin and Pittsburgh Lake. There are a few that are real challenges! They are all good fun, and most of the Utah 4 wheelers are a bunch of wussies who cry if they see a scratch in their paint. But if you can get past that, and are not above stacking a few rocks to compensate for not having lockers you can crawl with the best of them! The guys in the YouTube video make a big deal about a few rocks, but it's really not that bad of a trail, especially travelling in such a big convoy. I've always gone by myself, of course. Lots of fun. The paint and the rockers on the 4runner have no reason to save anything anymore. And Ruth, you would not believe what kind of punishment I have put those tires through. Don't worry about flat tires. You should see some of the places I have driven at Topaz Mountain. You would not want your boots on that kind of terrain! The 4runner cruised over it at 5mph, with no problem. But you've never rolled it, have you? That is an honor reserved for your sister. And yet, it doesn't appear too much worse for the wear! What a miracle. It still makes me giggle. How do we fix it? I have some money set aside for it. Can Lumpy help or something? I should tell you, the first big weekend I had the 4runner offroad, I found the old Deer Creek trail. It leads from Provo Canyon to Cascade Springs, but I think it is closed now. Anyway, at the time, it was partly flooded and FORDED across Deer Creek several times, MORE than THREE FEET DEEP! Okay, the 4runner can for 3 feet deep, but only if you're prepared for it. I had no clue. I was having the time of my LIFE, splashing through the deep puddles on the trail. Each puddle was about six inches of ice covering one or two foot deep puddle. As I splashed through, the ice would scatter in a spectacular spray, in all directions, and the car would plunge down into the puddle, then forge ahead like the powerhouse it was! Well, guess what? One of those big white icy patches turned out to be the banks of frozen Deer Creek! Envision my 4runner standing on its nose halfway up the hood deep in frozen Deer Creek, at about a 45 degree angle, front end under water, back end high in the air! I was scared to death for my brand new car! it would't go back, the skid plate underneath was hooked over the ice sheet. And it would go forward, but only deeper in water that was already oover the top ov the hood, and starting to run into the passenger comparment. My feet were getting wet! Okay, panic time! I first decide the only thing I could do was hike back to the highway and into Provo to get a tow truck. It was more than 5 miles of frozen dirt road and more than 10 more down to Provo from there, so I thought I better start hiking. I opened the door, or tried. It was such a steep angle, and so close to the stream bank that it just flopped down on the ground in the ice and water. That was when I decided, I had to try. I knew I had a few inches to work. I drove forward a little DEEPER, then back. It was so scary, I almost gave up, but I could think of nothing else to try, so I kept creeping forward an inch, then backing FAST! I slowly broke apart the sheet of ice that was holing me, and eventually broke free. When the ice broke out, the car backed up easily. After crying a few tears of relief and saying a prayer of thanks, I surveyed the damage. The headlights were broken and the running lights that you think look like sad little eyes were broken out. So Ruth, they have been broken for years. I never fixed them properly after the Deer Creek incident. I left them hanging loose as a reminder that even my mighty 4runner is not invulnurable to my personal hubris. On the first, I was tooling along a forest road about 50 mph - way too fast, but really comfortable in the 4runner. I did not notice a flat boulder that was about 8 inches higher han the bottom of my suspension. I Hit it pretty solidly with something really hard on the bottom of the car, and took off on a perfect ballistic trajectory for a point somewhere a loooooooooog ways from the point of departure! At least equal to EVEL KNEVILS Jump across the Snake River Canyon -- anyway, it seemed like that long before we contacted the solid ground with a WHUMP! that knocked all the wind out of me, and put me on a out of control crash course running into the stream about two feet deep and muddy. After spashing a bow wave forty feet wide and twenty high, I came to a steaming halt in the middle of that nice little stream, probably scarin the fish. I tremblingly restared the engine, which restared easily, and drove easily back onto the road. Shaking with fear, I inspected the undercarriage for damage, and was amazed to find nothing but a few new bright spots with paint missing. The rock did not fare as well as the 4runner, and was broken into small bits and scattered far and wide. It must have hit with a force somewhat equivalent to the detonation of a cannon shell. No harm done. The second incident was even more frighful. I was driving along a narrow shelf road just exloring, in much the same area. The roadbed was wet sand and mixed clay, but I was too fat dumb and happy cruising to have noticed that at the moment. Suddenly, I did notice that both my starboard side tires were slipping off of the roadbed into the duff. It just happened to be deep slippery pine needles over the wet sand and clay that I quickly discovered I could barely stand on myself. And it was a very steep side slope. So, the car was slipping sideways off the side of the road. Guess what? I stopped to take stock of the situation. I found that the front end was still gripping, but as I tried to inch forward, I was slipping ever further downhill in the back. The tire treads were not holding on the slippery duff. I stopped again, to think. What to do? The car was tipping more and more, and if I tried going much further forward, it would obviously tip over. I had nothing to guy with or steady, no block and tackle or winch, not even a shovel, nobody within miles. If I tipped over, I would be hiking out more than 30 miles, and my car wrecked. Then I noticed, below me 200 yards, another forest road. If I just backed up and threaded a path through the trees, over all the saplings and brush, and down to that relativly flat-looking road, I might be able to drive out of there. Long story short, after a quick prayer for some divine help, that's what I did. And I found my way out without wrecking. As I recall, that was the first time I sacrificed the auto-raise and lower radio antenna. Small price to pay. So Ruth, you're hardly the first one to put scratch and dent in the 4runner. It will fix up okay.